Follow the lead of Momoi! Japan’s proud anime culture goes overseas! Many of the participating groups promoted their own traditional culture and arts at the Honolulu Festival. This year, Haruko Momoi, who is an anime voice actress as well as a singer-songwriter came to promote anime culture under the theme of “spreading Japan’s proud anime culture to the world!” with her fans from Japan. Haruka Momoi loves anime and video games ever since she was little. She has been writing articles on anime over the internet since her high school years. Later on, she emceed for TV and radio programs. Also, she was producing idol groups and offered some songs. Not to mention, she has been releasing her CD and DVD as well. In addition, she is performing in the Anime Expo which is held all over the world. Furthermore, she is known as “Momo-i” among her fans which they are called “Momoist”. These Momoists exist not only in Japan but also in the U.S. mainland. Mr. Kent, who is a fan of Momoi from California came to Hawaii with 3 other fans. He instantly became her fan after he first saw Momoi on the internet back in 1998. Ever since then, he has been traveling to her events and concerts. Momoi’s fans from Japan as well as from the U.S. wanted for people to know about Haruko Momoi through this year’s Honolulu Festival. Hence, they prepared booklets consisted of lyrics to her songs in Roman alphabet and also, they brought glow sticks. As a matter of fact, the fans were discussing on the internet (such as blogs) about handing out their booklets to the locals in Hawaii prior to the festival. It can be said that there was already cultural exchange between fans in Japan and the U.S by wishing for Momoi’s successful performance. 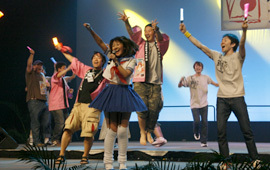 Haruko Momoi and her 20 fans from Japan have brought the vibe of Akihabara to the Hawaii Convention Center. The fans were singing powerful from the very beginning and they were standing in 2 rows in front of the stage. They were waving their glow sticks left and right which they were yelling in excitement. There was an original sticker on them which was printed “HALKO MOMOI 14th Annual Honolulu Festival Mar 15・16 2008”. Gradually, the audience got excited by Momoi’s upbeat number and her fans superb shouts as well as their dance (refers as Wotagei). Jackie Inada, who is a woman that lives in Hawaii for 25 years said “Momoi has a strong voice which is very ideal for the wide stage like the Hawaii Convention Center. I like her songs because they sounded fresh.” In addition, she was dancing to her songs with her grandson. After the performance, her autograph session was held, where there was a long queue. Even though she told her American fans that she can’t speak English, she still interacted with them through her heart. It can be said that Momoi successfully captured the hearts of the audience with her powerful performance. 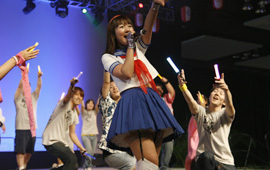 The performance by Momoi with her fans went beyond the subject of anime. This was a moment that the Japanese subculture traveled across the Pacific Ocean to Hawaii/ the U.S.
Momoi sang wholeheartedly. Also, the audience moved her to tears. Momoi responds to the cheers by the audience with all her might. You can feel her commitment and diligence. There was more excitement on the second day. The fans were lined up in the aisle and danced along with Momoi. The local children, adults and even seniors were observing those fans and swinging glow sticks in which they enjoyed the songs. Momoi was wearing loose socks (baggy socks) and dressed up in school uniform. Her appearance looked rare for the American elders which one of them was asking about it to the Japanese tourists. It was very intriguing for Americans to see the Japanese trends of young generation for the first time. Toward the end of the performance, Momoi called out her fans to the stage and danced with them. They performed a dance which is commonly referred to as “Wotagei”. They were dancing in unison which was fantastic. We felt that this dancing performance is crucial in the world of idol and anime. One of the crazy fans shaved the name “Momoi” into his hair, which we felt his passion toward her. There were people who heard about Momoi for the first time. Despite of it, she was able to capture the hearts of those that are not fans of anime. The fans are dancing for Momoi. They are powerful. Her fans are jumping, so does Momoi. They were perfect in tune with each other. The local Hawaiians as well as the visitors from Japan danced together. The local looked happy with his glow stick. Momoi took pictures with the visitors during her autograph session. Please come and visit Hawaii more often in the future! The show reached its climax when those so called “Momoist” got up on stage. At last, Momoi and the Momoists took pictures on the stage. Initially, Momoi’s autograph session was only scheduled for the first day, but it was held on the second day due to its popularity. The crowd of people gathered by the table to receive Momoi’s autograph. Also, there were anime fans from Kawaii-Kon which is a community of anime in Hawaii. Haruko Momoi was surrounded by many of her fanatic fans in which she was taking pictures and shaking hands with them. She was such a wonderful woman, who always shows her hospitality. This year, Haruko Momoi introduced a new culture at the Honolulu Festival. It is true that the anime culture is now international. The Japanese anime especially receiving a high rating and it is spreading to the world. We thought that it is an important part of cultural exchange for people outside of Japan including Hawaii to know a person like Momoi, who represents the contemporary anime culture. We are looking forward for Japanese anime characters to appear on stage as well as in the parade and interact with people from around the world. In the near future, there may be a cultural exchange among the anime characters from the U.S. as well as the countries of the Pacific Rim at the Honolulu Festival!